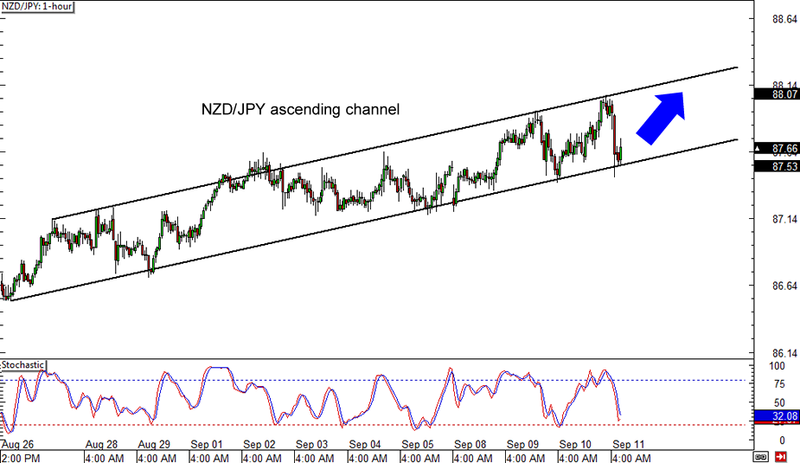 Let’s start off with a simple trend play on NZD/JPY. The pair has been moving inside an ascending channel on its 1-hour forex chart for the past few weeks and is currently testing the bottom. Stochastic is heading lower, indicating that there’s a bit of selling pressure left, but the channel bottom might continue to hold as support. In this case, NZD/JPY could bounce back to the top of the range, which is right around the 88.00 major psychological resistance level. On the other hand, a downside break from the channel support around 87.50 could be a signal that a reversal is in the cards. Now here’s a trifecta of resistance zones on EUR/AUD’s 4-hour forex chart! After bottoming out near the 1.3800 handle, the pair is now retracing to an area of interest. As you can see from the chart above, the falling trend line connecting the pair’s recent highs lines up with the 200 SMA and is close to a broken support zone. At the same time, it is also within the vicinity of the 61.8% Fibonacci retracement level and the 1.4250 minor psychological resistance. Stochastic has already reached the overbought zone, suggesting that euro bulls could charge sooner or later. 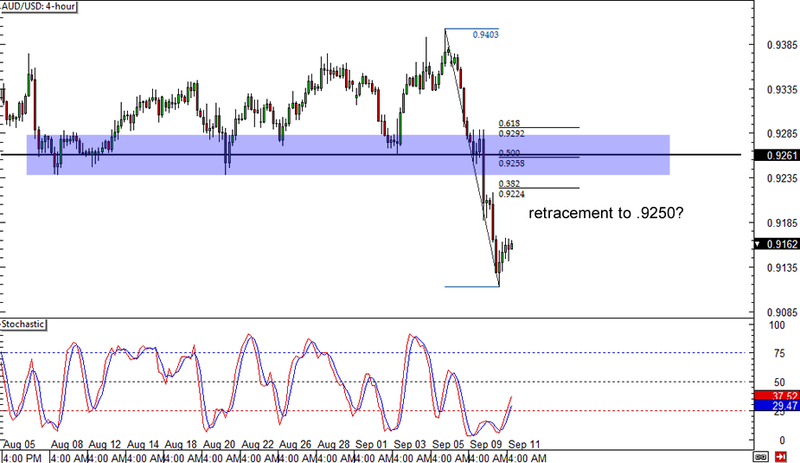 Last but not least is another potential retracement play on AUD/USD’s 4-hour forex time frame. The pair has been selling off pretty aggressively in the past few days, but it appears to be finding support near the .9100 major psychological level. 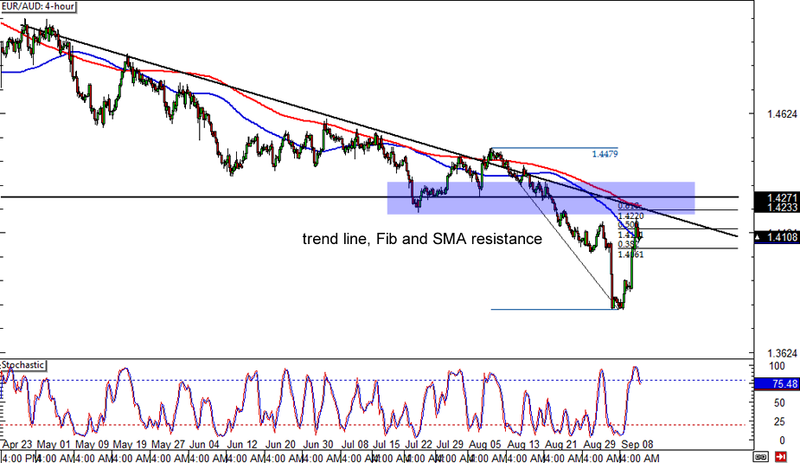 Stochastic is starting to climb from the oversold area, which means that Aussie bulls are in control for now. Drawing the Fibs from the latest swing high and low shows that the 50% retracement level lines up with a broken support area and the .9250 minor psychological handle, which might act as resistance for any rallies.